DEC documented five tree stand incidents and zero tree stand fatalities in 2018, down from 12 tree stand incidents the previous year. Of the 13 HRSIs that occurred last year, seven were two-party firearm incidents, six were self-inflicted, and three resulted in fatalities that could have been prevented if hunting safety rules and common sense were followed. Of the three fatalities, two were self-inflicted and caused by unsafe handling of firearms and one was a two-party firearm incident caused by a failure to positively identify the target. DEC’S Hunting Safety Statistics are available on the DEC website. Further examination of the seven two-party firearm incidents reveals that six (86 percent) of the victims involved were not wearing hunter orange, reinforcing the importance of identifying the target and beyond, and wearing hunter orange when afield—two tenets of hunter safety courses. New York’s HRSI rate recorded 19 incidents in 2017, 13 in 2016, and 23 in 2015. There were 98 incidents in 1991, 110 in 1979, and 166 in 1966, 13 of which were fatal. While the number of hunters is declining, the hunting incident rate (incidents per 100,000 hunters) is falling even faster. Since the 1960s, the number of hunters has declined about 20 percent, while the incident rate has declined almost 80 percent. 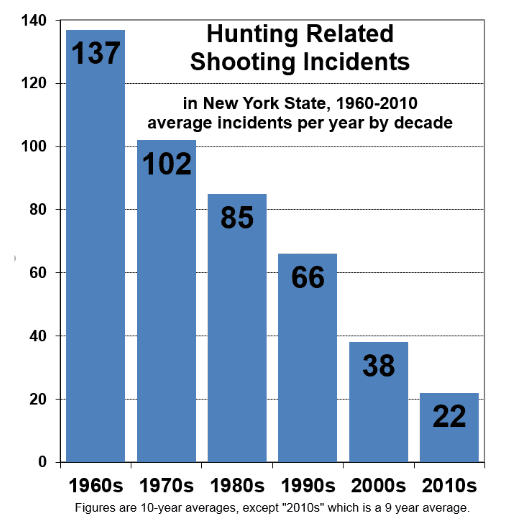 The current five-year average is 3.1 incidents per 100,000 hunters, compared to 19 per 100,000 hunters in the 1960s. All first-time hunters, bowhunters, and trappers must successfully complete a free hunter or trapper safety course and pass the final exam before being eligible to purchase a hunting or trapping license. In 2017, DEC Commissioner Seggos directed the agency’s Environmental Conservation Police Officers (ECOs) to begin tracking and investigating tree stand injuries for the first time. Tree stand injuries are under-reported, and DEC is not always notified when tree stand falls occur. In 2017, 12 tree stand incidents were reported and investigated, six of which proved to be fatal. In 2018, there were just five documented tree stand incidents and zero fatalities, and all five falls resulted from the hunter failing to use a body harness. Additional information about tree stand incidents is available on the DEC website. Tree stand safety has become a part of the hunter education course required of first-time hunters in New York. Tree stand incidents are a significant cause of hunting-related injuries. The proper use of tree stands and tree stand safety equipment will help to prevent these injuries and fatalities. Used correctly, a harness keeps the hunter connected from the time they leave the ground to the moment they get back down. 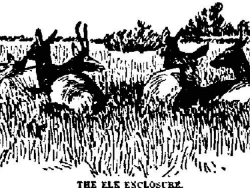 Illustration of hunting related shooting incidents provided. Interesting. Is this in NY or nationwide? Are those self-inflicted or injuries to a second party on the ground? How many are gunshot injuries vs. fall injuries? Just curious. ‘Not sure if all states are tallying tree stand injuries, but NY just started. The key word is “reported” injuries.